Tim requested pasta for dinner last night, and I found this gem hiding among my zillions of bookmarked recipes. As usual, Mark Bittman comes through with a simple but absolutely satisfying meal. 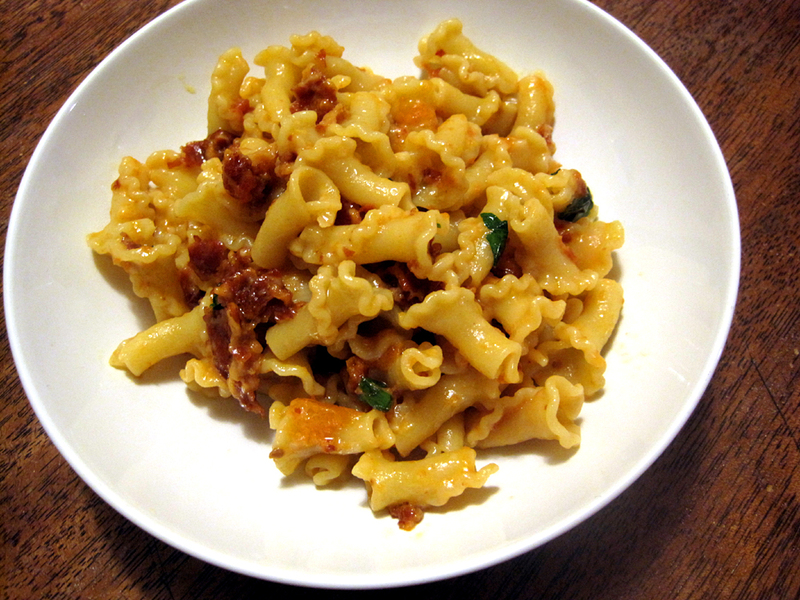 The pasta tastes rich and decadent with salty prosciutto flavor and soft, fragrant garlic. Believe me - your kitchen will smell insanely good while you're making this pasta! The garlic isn't roasted, but the procedure of slowly cooking it in oil on the stovetop results in a similar effect in less time. It's sweet and mushy (in the best way), and that strong garlic flavor is completely mellowed, making it possible to eat the whole cloves in the pasta without being overwhelmed by garlic flavor. Crushed tomatoes (I used home-canned ones) make the pasta a little sauce-y without the dish being one that's primarily made of tomato sauce, and fresh basil adds some bright flavor. Overall, this pasta was absolutely delicious and is definitely one I'll make again! 2. Heat the oil in a non-stick skillet over medium-low heat. Add the garlic and prosciutto, and cook slowly, stirring occasionally, until the garlic becomes soft and deep golden, 10-15 minutes. 3. Salt the boiling water and add the pasta. While the pasta cooks, add the tomatoes to the prosciutto and garlic and season with salt and pepper. Simmer, stirring occasionally. 4. Once the pasta is almost al dente, drain and return to the pot, reserving some of the pasta water. Add the sauce to the pasta along with the basil and cheese. Toss over medium heat until everything is nicely combined and the cheese is mostly melted. Add some pasta water if things seem dry. Serve right away. I'm submitting this post to Kitchen Bootcamp: Pasta and Dumplings. Oh, this looks tasty. Plus, I like the smaller portion! Sara, this pasta dish with proscuitto looks so delicious! My kind of meal, and it's just a bonus that it smells so good! Thanks for sharing, and for stopping by my blog. Sara, your pasta look fabulous, so rich in flavor with lots of garlic and prosciutto. Beautifully done. The weather this week is begging for a bowl of this. What kind of pasta is that? This recipe looks fabulous! Thanks so much for submitting it to my Kitchen Bootcamp challenge this month! I love pan roasting garlic cloves, but never would have thought to include them whole - sounds delicious! My husband and i will surely fight over those cloves (we're both garlic freaks).